Chancellor Gary S. May spoke to students at Zamora Elementary School in Woodland Feb. 22. I love the laboratories and lecture halls of higher education, but sometimes nothing beats the energy of a multi-purpose room or gym that’s packed with young minds. I’ve spent the last week taking part in Achieve UC, a school outreach program that helps K-12 students prepare for college. I pass along tips for their journey toward university life and answer questions about applying to a UC school. And we have a lot of fun as Gunrock, our beloved UC Davis mascot, tosses a few T-shirts and hypes up the crowd. As this column ran on March 1, I was surrounded by the sounds of the school band at Inderkum High School in Natomas. I’m speaking at this pep rally of college preparedness in their school gym with Janet Napolitano, president of the University of California. But my first stop took place on Feb. 22 when I visited Zamora Elementary School in Woodland, also known as “Home of the Zoonies.” (Just for the record, a “Zoonie” is their school’s snail-like mascot). When I showed up, the school was decorated with balloons in the UC Davis colors of blue and gold. They had welcome signs saying, “UC Davis Rocks.” And they had plenty of great questions when I spoke to an assembly of fifth- and sixth-graders. For the second half of my visit, I pulled up a chair while a combined group of sixth-graders sat in a semi-circle to ask more questions. These students didn’t act “too cool for school” at all. I was impressed by their eagerness to learn more about UC Davis and what it’s like to go to college. This sign greeted Chancellor Gary S. May at the Woodland elementary school he visited on Feb. 22. More than anything, I wanted to leave them inspired and get them thinking more about college over these next crucial years. For those who weren’t in the Zamora Zoonies’ multi-purpose room with us, here are some of the key points I shared. Now’s the time to develop good study habits and get involved with activities that help you grow as a person. Play sports. Join the school band or school council. Every positive step you make will get you closer to college. Each of you has what it takes to attend UC Davis or another UC school. Everyone has a talent and something they love to do. A university like UC Davis is a perfect place to dig deeper into things you like and open your mind to even more possibilities. Hard work and a willingness to learn will unlock many doors, and you’ll find a lot of people along the way who are ready to help. Some students might enter a four-year university right out of high school. Others may transfer from a community college or attend later in life. No matter what route you take, UC Davis and its sister schools have plenty of resources and support systems to help you succeed. Take the path that makes the most sense for you. We have some good news: The UC system offers some of the most robust financial aid programs in the country. More than half of UC’s California undergraduates actually pay no tuition. We have programs like UC’s Blue and Gold Opportunity Plan, along with other grants and scholarships, that are ready to help. Whether you want to develop apps for smartphones, write the next great American novel, work towards social justice — or whatever motivates you in the morning — we have a place for you. The greater the mix of people and perspectives on campus, the better. UC Davis is a place where the world comes together and we want you to help shape our story. So, dream big, keep working hard, and one day you’ll be bound for college. I look forward to seeing you on campus! 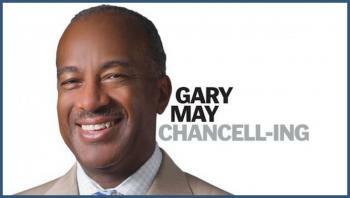 Chancellor Gary S. May’s monthly column appears first in The Davis Enterprise and then in Dateline UC Davis. See photos and read about a visit to Inderkum High School by Chancellor Gary S. May and UC President Janet Napolitano, where they were interviewed on a podcast about college readiness. Chancellor Gary S. May Gary S. May became UC Davis’ seventh chancellor on Aug. 1, 2017. He leads the most comprehensive campus in the University of California system, with four colleges and six professional schools that offer 104 undergraduate majors and 96 graduate and professional degrees.